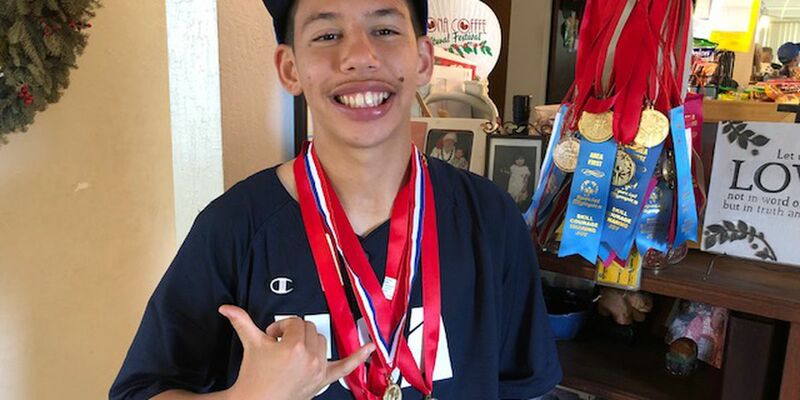 Tyler Morimoto, 17, will run in three track events at next month's 2019 Special Olympics World Games in Abu Dhabi. The Roosevelt High School student will anchor the USA men's relay team. HONOLULU (HawaiiNewsNow) - Tyler Morimoto spends a lot of time on the track. “I like running,” he said. The 17-year-old Roosevelt High School student trains with the school’s cross country team. He's also a standout athlete with Hawaii Special Olympics. “I think it was just by my coaches pushing me to the limit, saying, ‘OK, Tyler, you can do better. Try your best and try your hardest,’” he said. All that hard work and encouragement paid off. Next month, Tyler will represent Team USA as one of 7,000 international competitors invited to the Special Olympics World Games in Abu Dhabi. He'll run in multiple races. "In the World Games in Abu Dhabi it will be the 3K, 1500 and 4x4 that I'll be competing in," he said. For the relay, he’ll run the anchor leg. Tyler got involved in Special Olympics when he was 7. He has competed in soccer, basketball and track. "We're proud of Tyler. Just to see him achieve and continue to grow in stature and his abilities," said his mother, Dee. Khiry “Rainie Jade” Thompson is the other Hawaii athlete going to the games, and Honolulu police officer Rob Steiner will participate in the torch run. “He’s going to run in the final leg. He’ll be one of 88 global officers worldwide that will be running the torch through the United Arab Emirates,” Special Olympics Hawaii COO Dan Epstein said. "Opening and closing will be in Abu Dhabi. Tyler will actually compete in Dubai," Dee Morimoto said. Tyler's doing his homework on Abu Dhabi, learning about the food and the language, including how to introduce himself in Arabic. "You say, 'Ismi, my name is Tyler' or you can say, 'Hello, ismi, my name is Tyler,'" he said. He’s hoping for a Gold medal, but is honored and excited just to be in invited to the prestigious event. "Like it says in Special Olympics, 'Let me win. But if I cannot win let me be brave in the attempt,'" Tyler said. To help Tyler with travel costs, click here.